In case you were wondering what was up with that black paint on the CVS Pharmacy building in Buckhead, the answer is a new furniture shop. 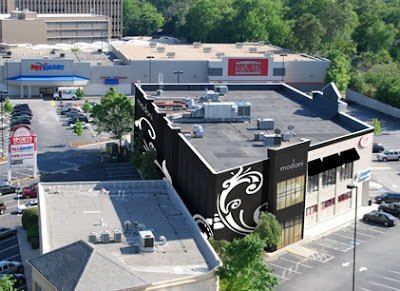 Miami, Florida-based Modani quietly opened their new Buckhead location at Buckhead Pavilion Shopping Center. The store had a soft opening last week "because we had customers waiting to shop" said an employee with whom I spoke. Modani offers residential and commercial contemporary furniture, lighting, decor and design services. The roughly 11,000 square foot Modani replaces what had most recently been an Ethan Allen store. Buckhead is already home to contemporary and modern furniture from Mitchell Gold + Bob Williams, Design Within Reach and Roche Bobois as well as Atlanta's own HUFF Furniture. Artefacto, a Brazil-based contemporary furniture retailer, opened at Two Buckhead Plaza in 2006, but was closed by 2009. Modani has existing locations in Miami, New York, Los Angeles, Houston and Chicago. Additionally, the company has a rather long list of "upcoming stores" including San Francisco, Washington D.C., Dallas, San Diego, Boston, Philadelphia, Seattle as well as Toronto, Montreal and San Juan, Puerto Rico. Have you been to Modani in Miami or elsewhere and are excited by their opening? Do you think Modani will do better than its predecessor, Ethan Allen? Did you lose interest once I said the opening was that of a furniture store and not a return of EatZi's? That's fantastic news. This is the first time I've learned Modani is now opened and I'm looking forward to visit that such attractive furniture showroom. Thanks. I've never been in Modani before, not in the Miami outlet. It's very near to my living place. Looking forward to check it out to buy some trendy furniture's for my new home. Thanks.